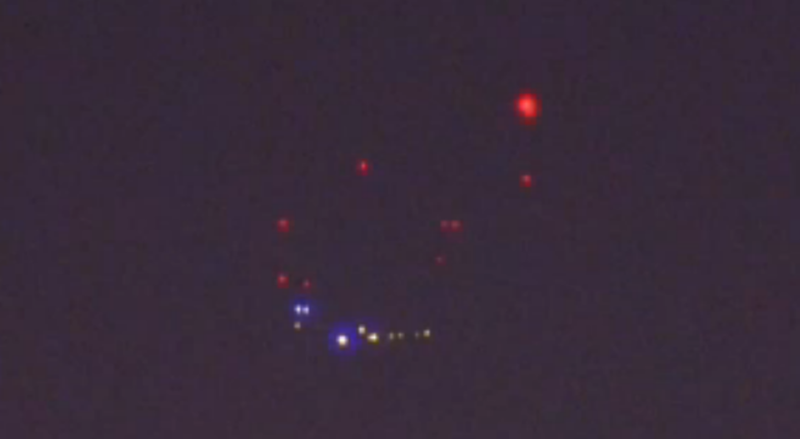 When several callers phoned into San Diego's NBC News affiliate April 28, the station captured this unusual colorful grouping of aerial lights over San Ysidro, close to the U.S.-Mexico border. "Some said they appeared to be red, blue, and green and kept flashing and changing colors. Some who saw them say the lights didn't seem to move, like those on a plane or a drone," NBC 7 San Diego reported. According to the station, "We put in calls to the military here to see if they could identify what these were. So far, no response." It wouldn't be the first time that UFOs had been reported to local military bases around San Diego. Previously classified government documents under the Air Force's former Project Blue Book UFO study show how San Diego's military has seen its fair share of UFO reports. Regarding this most recent case of odd lights in the sky, the TV station itself has stopped responding, after UFO researchers and The Huffington Post called, asking for details of the event. On the evening the video was shot, NBC 7 had been in the San Ysidro area working on an unrelated story. One eyewitness, Larry Fox, sent UFO photos to the TV station in which he described seeing something that "looked like a strobe light." Fox told NBC 7 he didn't feel it was a plane or drone. "It was a series of flashing lights. If it was a plane, it would have moved." Two UFO sightings near volcano in Mexico, one caused an explosion?